Nearly 35 years ago, in the summer of 1981, George Lucas, Steven Spielberg, and Harrison Ford banded together to introduce moviegoers to a new kind of action hero. In the intervening years, Indiana Jones has made three more big-screen appearances (plus one television series)—with one more film on the way for 2019. In the meantime, we're looking back at the first four films in the series. 1. ONE DOG INSPIRED BOTH INDIANA JONES AND CHEWBACCA. While developing the film with Spielberg and screenwriter Lawrence Kasdan, Lucas named the main character “Indiana Smith.” But Spielberg protested that it was too similar to the 1966 Steve McQueen western Nevada Smith and requested a change. The three agreed that the last name should be as universal and nondescript as “Smith,” so Lucas threw out “Jones” as a possibility. Indiana came from Lucas’ dog, an Alaskan malamute named Indiana. The big, hairy pup was also the inspiration for Chewbacca from Star Wars. 2. A RECEPTIONIST AT LUCASFILM HELPED OUT WITH RAIDERS OF THE LOST ARK’S SPECIAL EFFECTS. Advanced CGI was still far off when Spielberg tasked the effects wizards at Industrial Light & Magic (ILM) to create the otherworldly elements for his film after the fact. To create the deadly specters that emerge from the Ark, ILM model maker Steve Gawley suspended small puppets with silk robes into a clouded water tank in front of a bluescreen. Puppeteers would shake the model back and forth in the water to achieve the surreal flowing movements Spielberg wanted, which would then be composited onto the actual footage by optical supervisor Bruce Nicholson. To pull off the effect where an idyllic ghost floats toward the camera, only to reveal a hideous visage, the ILM guys found a receptionist from Lucasfilm and outfitted her in long white robes and painted her face a ghostly shade of blue and white. They then had her sit on a flat trapeze mechanism in front of a bluescreen and swing away from camera—which was run backwards in the final film to achieve a dreamlike quality. The receptionist’s performance was then composited with a grotesque, skeletal model to create the final transformation. 3. THE ACTOR WHO PLAYED SHORT ROUND WAS DISCOVERED BY ACCIDENT. Spielberg and casting director Mike Fenton were having trouble finding the right young actor for Short Round, so they put out an open casting call at an elementary school in Los Angeles and eventually found actor Ke Huy Quan ... but not directly. Quan’s mother brought in his older brother to read for the part of Short Round, but during the screen test the younger Quan began telling his brother what to do, which caught the eye of producers Kathleen Kennedy and Frank Marshall. They asked him to do his own taped audition for Spielberg. It was so good that they invited the youngster to audition with Indy himself, Harrison Ford. Because the young would-be actor couldn’t read English very well, Spielberg decided to let him improvise during the audition—similar to the way he found young Henry Thomas for E.T.—telling him to play cards with Ford and gradually realize he had been cheated. 4. KATE CAPSHAW’S PRICELESS DRESS WAS EATEN BY AN ELEPHANT ON-SET. 5. TEMPLE OF DOOM FEATURES ONE OF SPIELBERG’S PERSONAL FAVORITE MOMENTS FROM HIS ENTIRE FILMOGRAPHY. 6. TEMPLE OF DOOM CREATED THE PG-13 RATING. Think about this: a movie that includes a man pulling the still-beating heart out of another very-much-alive man who is then lowered into a searing pool of lava to die is rated a family-friendly PG by the Motion Picture Association of America. Parents and audience members alike were taken aback by the violence in Spielberg’s second Indiana Jones film, but the violence and horrific aspects weren’t enough to warrant an R rating (one that would cripple a film that relied so heavily on being a family-friendly film). Once a controversy about the violence in Temple of Doom and Gremlins (a film Spielberg executive produced) arose, Spielberg wrote to Jack Valenti, then-President of the MPAA, suggesting an in-between rating for movies of similar ilk. The director suggested four new potential examples, including “PG-13,” “PG-14,” “PG-2” or “R-13,” which would limit or allow certain audience members admittance between PG and R-rated films. Valenti soon enacted the new system, labeling director John Milius’ film Red Dawn with the first ever PG-13 rating. 7. SPIELBERG MADE INDIANA JONES AND THE LAST CRUSADE TO APOLOGIZE FOR TEMPLE OF DOOM. After the masterpiece of spirited adventure that was Raiders of the Lost Ark, some critics and audience members felt betrayed by the grim and gruesome sequel. Spielberg was hardly a defender of the movie; in 1989 he admitted, “I wasn't happy with the second film at all. It was too dark, too subterranean, and much too horrific. I thought it out-poltered Poltergeist. There's not an ounce of my own personal feeling in Temple of Doom." Spielberg’s involvement in a third Indiana Jones film sprang from his desire to apologize to viewers for the series’ disappointing second outing, and to revive the earnest spirit of the original. He re-hired supporting stars Denholm Elliott and John Rhys-Davies to double down on the Raiders ambiance. 8. A RENOWNED PLAYWRIGHT SECRETLY PENNED THE INDY/HENRY MATERIAL. Since the relationship between Indy and his estranged father, played by Sean Connery, provided the emotional meat of the story in The Last Crusade, Spielberg and Lucas hired a ghostwriter to bolster the gravity of the characters’ interactions. Celebrated playwright Tom Stoppard contributed the bulk of the Jones boys’ material, but didn’t receive a writing credit. 9. FORD AND CONNERY TOOK OFF THEIR PANTS WHILE SHOOTING ONE SCENE. A little more than halfway through the film, Indy and Henry converse over a private table while hiding out on a German zeppelin. Unbeknownst to viewers, beneath the table neither Harrison Ford nor Sean Connery is wearing pants. Excessive heat on the set prompted Connery to remove his slacks while shooting the scene, and Ford followed suit. 10. THE MOVIE HELPED TO PIONEER THE RAT INSURANCE GAME. The rat-filled subterranean sequence early in the film proved to be a complex problem: the presence of the rodents cost the film its first choice of female lead, Amanda Redman, as she was too afraid to perform alongside the critters. Then, the production team had to breed its own grey rats for the scene—thousands of them—in order to have enough rodent firepower that was definitely disease-free. Finally, there was the unprecedented matter of taking out an insurance policy on the unpredictable creatures. After some negotiation, the Fireman’s Fund Insurance Company did indeed grant Paramount Pictures the very first (and more than likely last) “thousand-rat insurance policy.” The policy would have paid off if the production had lost more than 1000 of its rodents. 11. THE DEATH OF WALTER DONOVAN WAS A BENCHMARK IN DIGITAL EFFECTS. The rapid degradation of Julian Glover’s villainous character, Walter Donovan, following a sip from a particularly unholy grail (“He chose poorly”) is considered the first complete digital composite shot in Hollywood history. Glover was filmed in several separate stages of the sped-up aging process, which were digitally melded together (along with shots of puppet heads for some of the later stages) and translated back to film as one cohesive take. 12. THE LAST CRUSADE DID WONDERS FOR PETRA’S TOURIST DRAW. After the release of the movie, international interest in Petra—where some of the film's scenes were filmed—skyrocketed. Prior to the film, the city saw only a few thousand visitors every year. That number reached into the millions following Last Crusade’s release. 13. 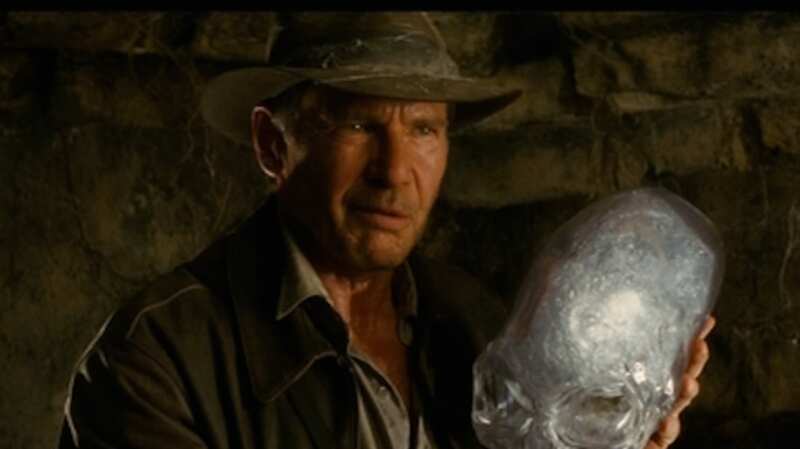 SHIA LABEOUF WASN'T A FAN OF INDIANA JONES AND THE KINGDOM OF THE CRYSTAL SKULL. 14. SEAN CONNERY SAID NO TO A CAMEO IN THE CRYSTAL SKULL. As tempting as it may have been for Sean Connery to re-team with Ford on The Crystal Skull, the happily retired former James Bond turned down the part. Ever since Henry Winkler attempted to sail over a shark in a late-season episode of Happy Days, the phrase “jump the shark” has been used to describe the point where a television series goes off the rails in its ridiculousness. The Crystal Skull spawned an alternative phrase for that, known as “nuking the fridge.” And Spielberg seemed surprisingly pleased about it.